Craft beer lovers are flocking to Au Coin Mousse, Geneva’s first genuine ode to beer. 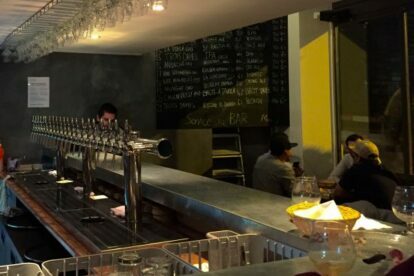 On any given evening, you’ll find a band of locals, old and young, sipping from a selection of 21 craft beers on tap from Geneva, Switzerland, and the immediate surroundings. From sweet to sour to bitter in every shade of white, pale, amber, brown and black, there is a beer for literally everyone. And the small serving sizes of 3 or 4dl set you up to taste your way through them all – eventually. Not sold on beer? They offer wine and simple cocktails as well, so no need for the beer haters to go dry. A plat de charcuterie, complete with cured meats, sausage, cheese, pickles and bread leaves no room for doubt that you’re in Switzerland, and does a great job of cleansing your palate between beer tastings. They’ve also just added veggie options. A variety of bagels and salads are also available if you’re looking for something a little heavier. Its location, just minutes away from the central train station at Cornavin, also makes it a great option for a pit stop. Next time you’re on your way in or out of town by train, be sure to factor in an extra hour to try out this delectable watering hole.